Since this webpage was originally posted, Rodney Tom's real estate and brokerage licenses have been canceled (cached, cached). In his 2010 election literature, Tom states he worked for 18 years as a "Realtor" without mentioning Windermere's name (source, cached). Note that he does not tell voters his current source of income. (1) On August 6, 2010, we wrote another letter to Sen. Tom, again urging him to help protect Washington real estate consumers (source). Since Sen. Tom doesn't work for Windermere anymore, he should be willing to help, right? We will post his response to our letter as soon as we receive one. (1) On August 6, 2010, Department of Licensing records revealed that Tom is now the sole proprietor of "Bentley & Associates" located at the same business address as Windermere Real Estate/East Inc., aka "Windermere Kirkland/Yarrow Bay" at 3933 Lake Washington Blvd., NE, Suite 100, Kirkland, WA 98033 where Tom used to do his real estate brokering (cached). For the sake of historical accuracy, we retain the webpage below as originally posted in June 2009. Rodney Tom knows about Windermere’s unlawful and predatory business practices and the collusion of the Department of Licensing — and says he will do nothing about it. See what Rodney Tom knows: Visit the Windermere Gallery. "I am not a Windermere broker." 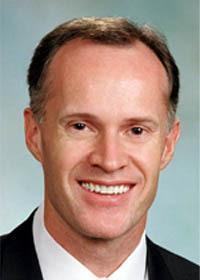 On April 15, 2009, we (Mark and Carol DeCoursey) wrote to our state senator, Rodney Tom, asking for his help in compelling the Department of Licensing to enforce state law on the Windermere real estate syndicate. Yes, we knew Sen. Tom is a Windermere associate broker at the Kirkland-Yarrow Bay Windermere office, but we hoped he'd put his company's business interests aside and work for the good of the people. Sen. Tom did not answer our letter, nor did he return the numerous calls we made to his office. On June 11, 2009, we wrote him a letter of reprimand. On June 24, 2009, Sen. Tom called us at home on the telephone. The account of that extraordinary conversation is told below in our June 26 letter to State Senator Rodney Tom. "We [Windermere] can be a big company when it comes to buying power ..." says Rodney (cached). This photomantage is not intended as a news photo, but as political commentary. 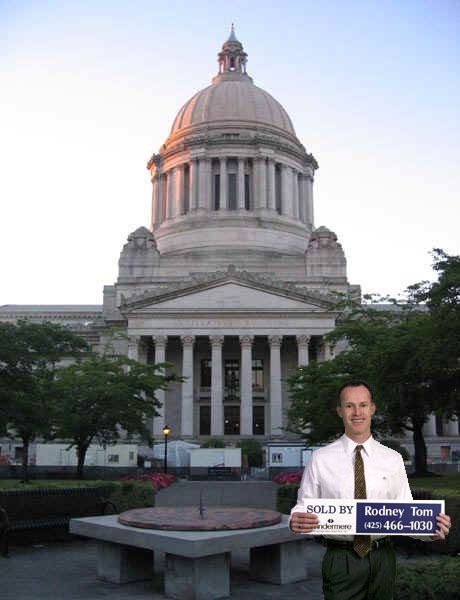 We have no evidence that Tom was the official listing agent on the sale of the Olympia legislature. The quote, however, is true history. In a June 24, 2009 phone call, Tom told DeCourseys, "I have no financial ties with Windermere." 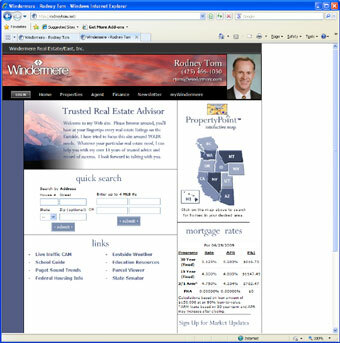 But his personal web page, http://RodneyTom.net (cached June 28, 2009), shows that statement is a "Windermere truth." Even the title of the page is "Windermere - Rodney Tom." Tom argued that he does not work for Windermere, he is an "independent contractor." But Windermere's lawyers tried that argument in Rodriguez v. Windermere Real Estate/Wall Street, Inc. in 2008, and the Appeals Court laughed as only judges can laugh: they referred to that relationship as "employer," "employee," "employment," etc. fifteen (15) times in the decision, and Windermere lost the appeal. On the phone on June 24, 2009, Rodney Tom said his real estate license was not hung with Windermere. We asked who it was hung with, and Tom answered that he does not know, it may be inactive. Well no, Rodney, according to the Department of Licensing, your real estate broker license is fully active and the listed address is the address of Windermere Real Estate /East, Inc. brokerage, aka "Windermere Real Estate /Kirkland-Yarrow Bay." 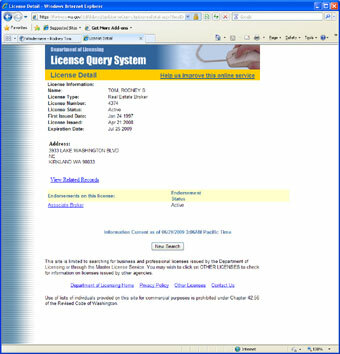 The DOL's current status of Tom's license can be found through the DOL search page (license cached on June 28, 2009). 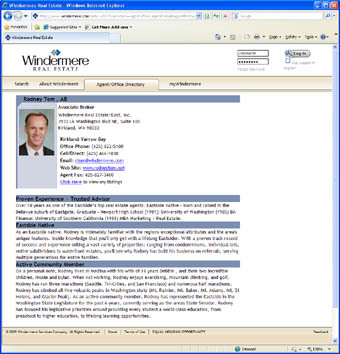 Though Rodney Tom denies his employment with Windermere, Windermere says that Tom works for them (cached). 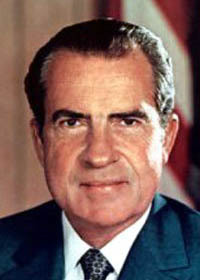 Is this more Nixonian honesty? Or should we call it Windermerean integrity? 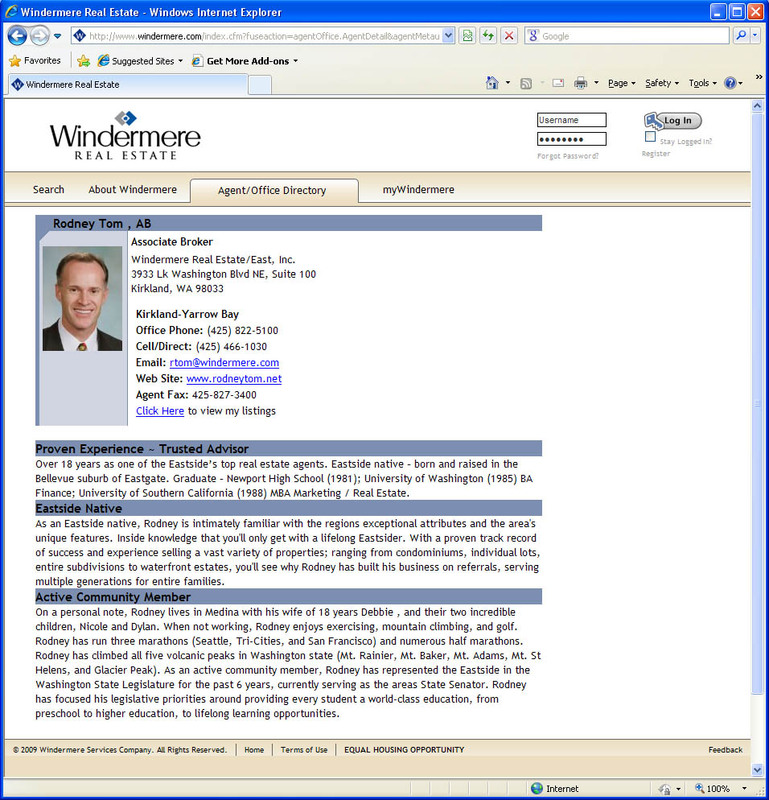 Windermere maintains a personal page for Rodney Tom's sales efforts (cached), describing him as a Windermere "associate broker." The text gives us a short bio of Tom's education and real estate career, and includes a short recap of Tom's political career in the Washington legislature. CampaignMoney.com tracks the money contributed to federal political campaigns. 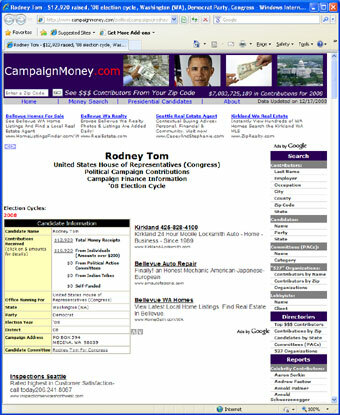 The page on Rodney Tom's 2008 Congressional campaign includes $12,920 that Tom contributed to his own campaign. In the paperwork accompanying that contribution, Tom listed "Windermere" as his employer. Our caller ID device shows that Senator Rodney Tom's call originated from cell phone number (425) 466-1030. Ironically, even as Tom was denying he works for Windermere, he was using the same phone he advertises for his Windermere real estate activities (cached). 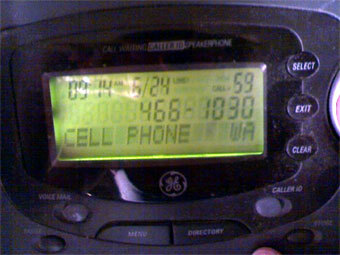 This note will memorialize your phone conversation with us, Carol & Mark DeCoursey, on June 24, 2009 in which you a) accused us of lying about you, b) denied you are a Windermere associate broker, c) pretended we had asked you for a personal favor, and then d) rejected our plea for help in breaking up the collusion between Windermere and the Department of Licensing. You called our home at approx. 9:15 am and asked to speak to Carol. When I (Carol) picked up the phone, you asked me what I wanted you to do. I answered that we wanted you to help us to compel the Washington Department of Licensing to enforce Washington real estate laws on Windermere, either through a Writ of Mandamus or some other device. You said we'd first have to stop lying about you before you would consider any constituent request from us. You referred me to our webpage, RenovationTrap.com, saying that we had told lies about you on that page. I immediately offered to post any written correction you might care to make on that webpage, and pressed you for specifics. You are not affiliated with Windermere and have no financial ties with them. Your real estate license is not hung at Windermere. When I asked where your real estate license was hung, you said you do not know, that your license may be inactive. You do not know John Jacobi, the founder of Windermere. It is hard to do something for people who were insulting and lying about you. Of the tens of thousands of transactions Windermere puts through, naturally some go bad. The building industry hates you for your attempts to protect home buyers. The real estate industry does not like you. We asked you to put your comments in writing on your letterhead so we could post them to our webpage — we want to be fair and give the issues a public hearing. You told us "No," that you that you were making a telephone call so that "no one can say I didn’t respond to you." You have no intention of honoring our constituent request until we stopped lying about you. We have two other legislators, and that we should write to them for help. The banner across the top of your personal webpage (http://rodneytom.net) announces your affiliation with Windermere — complete with the Windermere logo. Your email address is given as rtom@windermere.com. At that website, you tell the public you are a state senator (cached). The Department of Licensing webpage shows you have an active broker's license. 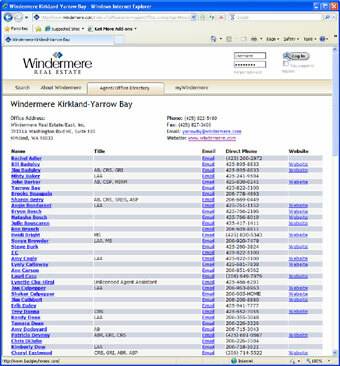 That is the address of Windermere Real Estate/East, Inc., also known as "Windermere Real Estate Kirkland-Yarrow Bay." You may recall that about two years ago, we visited you at the Windermere Kirkland-Yarrow Bay office ... How can you now ask us to believe you are not affiliated with Windermere? Windermere maintains a web page with your picture and a sales profile. That page says you are a Windermere associate broker and a state senator. During your Congressional bid for the 2008 electoral cycle, you reported that you made a $12,920 contribution to your own campaign — and you listed your employer/occupation as "Windermere." Windermere is concerned about you, too. When Windermere deposed us in 2007, Demco Law Firm lawyers spent valuable lawyer time quizzing us about you. They asked why we thought your seat on the Senate Consumer Protection and Housing Committee was a conflict of interest. They worried about our public criticism of that arrangement, and they tried to convince us we had no right to speak of it. What you do and how you are perceived is important to Windermere. You are an "independent contractor"
You asserted that you not associated with Windermere, you are an "independent contractor." Does that mean you sometimes work for John L. Scott, Re/Max, or Coldwell Banker Bain? Real estate agents and associate brokers are "independent contractors" only with respect to income tax — in all other matters, agents and associate brokers operate under the auspices of their designated brokers. In order to maintain a real estate license, the license must be registered with a specific brokerage — no independence there. Real estate textbooks teach that real estate agents are, in fact, agents of the broker, and represent the broker in all transactions; if a dispute with a customer arises, the dispute transfers directly to the broker in whose name the transaction took place. No independence there, either. In the recently published Washington Appeals case Rodriguez v. Windermere Real Estate /Wall Street, Windermere lawyers (Demco Law Firm) attempted to argue that Windermere agents are independent contractors. The judges ignored the argument and referred to the relationship as "employment," "employees," and "employer" throughout the decision, clearly indicating their opinion of this verbal artifice. In short, the "independent contractor" argument is a specious dodge not supported by the law, the courts, or reality. You stated you have no financial ties with Windermere. In that case, we respectfully inquire: How, then, do you earn a living? You stated that with Windermere’s volume of business, things are bound to go wrong occasionally. 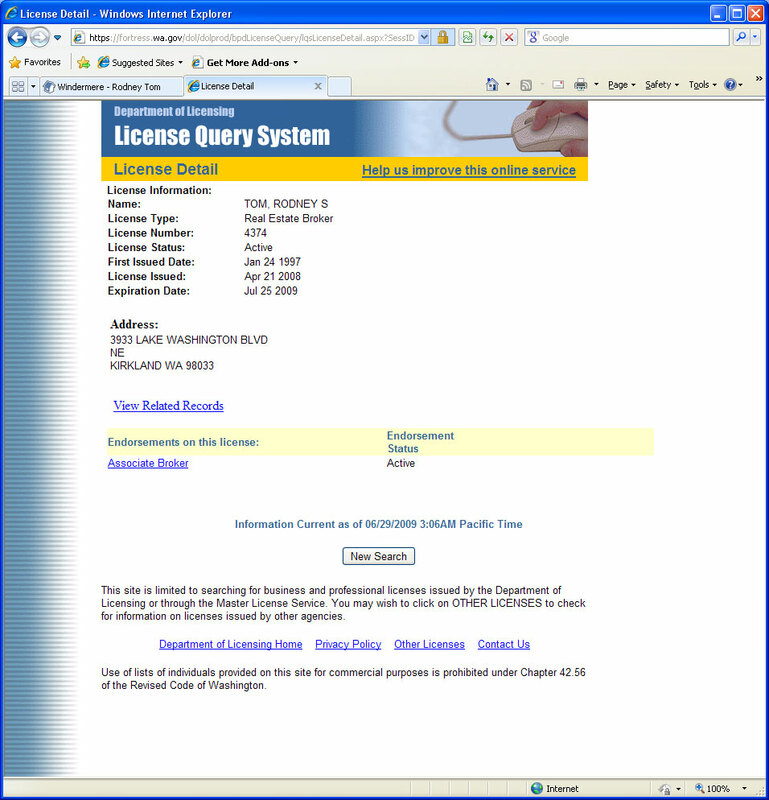 In fact, Rodney, the very web site of which you complain — RenovationTrap.com — contains many examples of outrageous Windermere conduct and Department of Licensing complicity. These are not simply deals gone bad. These are deals that were rotten from the inception. What do you think of the Endicott case? Two Windermere agents swindled a mentally confused old widow out of her prime Whidbey Island waterfront property. Or the Kruger case? A Windermere agent knowingly sold a rat infested property to an unsuspecting consumer without disclosing the infestation. Or the Bloor case? A Windermere agency knowingly sold a house that had been used for the manufacture of methamphetamine — without disclosing the fact. And we cite others, too. You pretend these bad deals are uncharacteristic of Windermere. If so, why doesn’t Windermere make up the damage to the customers immediately, instead of forcing people into lawsuits and trying to bankrupt them with legal expenses? Aside from lying in court, the Windermere lawyers regularly argue that Windermere has no liability because Windermere agents are independent contractors — not unlike your characterization of yourself. And though the DOL sanctions other brokerages, sometimes closing them down, it never touches Windermere. More than a dozen real estate agents, real estate brokers, and executives of real estate investment firms contributed to your campaign. The report shows that Becke Homes (http://www.beckeshomes.com/) — the firm that builds breathtakingly lavish mansions on the Mercer Island waterfront — made a contribution to your campaign. So your claim that you are hated by the building and real estate community does not quite check out, either. In any event ... we get the message. You will not take any action that would negatively affect the Windermere syndicate. You pretend we have asked a personal favor. But we have just asked you to do your job. We are your constituents. The collusion between the Windermere syndicate and the Department of Licensing is causing enormous harm to Washington citizens. You are a member of the Senate Judiciary Committee. We asked you to advise the legislature and take effective action. Your excuse — that you won’t help protect Washington citizens because we are "lying" about your relationship with Windermere — is a bizarre but very revealing invention. If you were acting in good faith as a legislator, the truth about your affiliation with Windermere would not hurt. You would have no reason to deny that affiliation. You would have no reason to refuse our request. Think about it, Rodney: If (a) we were lying about your relationship with Windermere and (b) in fact you had no relationship, and (c) you were interested in the welfare of the Washington public, (d) you would not pretend we had asked for a favor. You’d be (e) justifiably angry at the Windermere/Department of Licensing collusion and (f) you would leap to the task of breaking up that collusion. So far, you convincingly demonstrate you are in the legislature for private advantage, not public interest. We respectfully and urgently request you to reconsider your position, your oath of office, and your duty to the people of Washington. People are regularly betrayed and lose their life savings because they trust Windermere, the Realtor Code of Ethics, and the Department of Licensing to protect them. You have the power to make a difference. Will you use it?